strategy — Cobblestone Creative Co.
How many times have you followed that with an eye roll or mumbling under your breath, "Not my list." Then you kinda get mad because it's not happening for you ... and you kinda wish it would. You’re bringing in money but it’s not coming from your list. You've spent so much time building relationships that you didn't have time to build your list. You're pretty sure your list is dead, and you don't know if you should revive it or scrap it and start over. And you know that getting ready to scale your revenue online is all about being able to leverage email. It takes next level email strategies. But almost instantly, you feel a little sick to your stomach because everyone else’s next level email strategies are basically copy-and-paste, sleazy, push-fests and your business or nonprofit is built on genuine relationships. I’ve got good news for you: there’s actually a way to use email to build real relationships. And if you do it well, you’ll get paid well too. In short: you can have it all. Savvy, scalable email strategies and also real life, deep relationships with your people. And that means relationships are our top priority. But we’ve got some hard truth for you … you’re actually missing out on some dynamite relationships and customers that are lurking inside your email contacts RIGHT NOW. They open everything. They take a look at your offers. And all they need to hop off the fence? The right opportunity to hit them at the right time. There are no copy-and-paste, everyone-and-their-grandma-have-the-same-funnel email sequences here. Instead, we give you a complete relationship marketing system inside your email provider that leads to heart-centered cashflow -- because our email strategies built on the principles of human-driven communication and behavior-based automation. ... all through the magic of email automation. But our favorite part? That you’ll be building your legacy by bringing more people into your mission. Here’s how we can help you do that. "I have content upgrades that bring in a consistent lead and my email list is growing. All sounds good and while I don't have trouble turning my traffic/visitors into subscribers, I face difficulty turning the subscribers into customers (read: purchasing our templates) because my funnel/email sequences were a mess + only speak to one type of audiences. Kate did an audit of my existing welcome sequences and provide the strategy on how we can segmentize the leads and keep them from going through multiple sequences (no more subscribers that sign up to multiple opt-ins and receive the same welcome sequences multiple times). 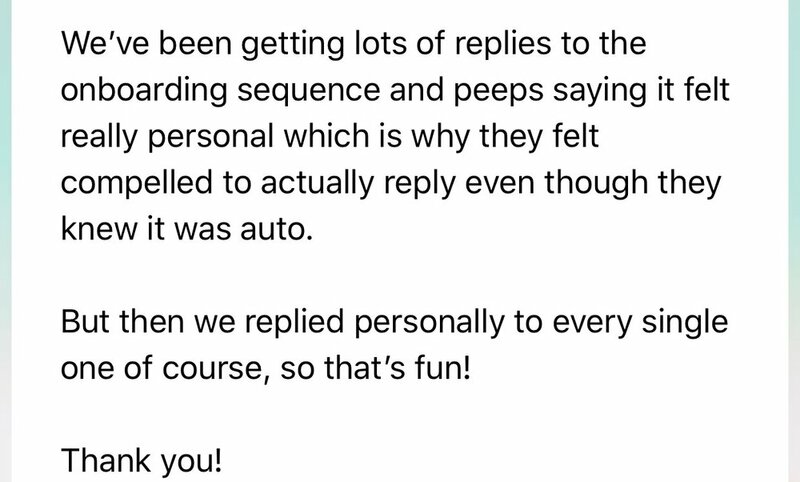 Kate is amazing at writing email sequences that feels so human and personalized to my business. I also hired her for implementation which is the best decision ever, because I have a working welcome sequence that's up and running in +/- one month time. It saves me so much time from trying to figure out the technical part myself. Totally worth the investment!"